The Michelle B. Giveaway is live! Good luck to all who enter. Attached are a couple of projects I have worked on. The first is gift tags. these are really simple to make. Each design is a craft square, a stamped mandala design, a circle punch and stamped image - some directly on the circle punch and others on another punch out which is then glued to the circle. 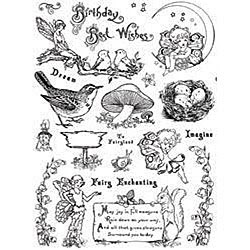 The stamped images are colored with marker, pen, colored pencil, stickles glitter glue, etc. Once complete the tag can be quickly assembled - the circle is glued on the front of the card, a hole punched in the corner and threaded with embroidery thread. I did distress some of the edges - some better than others. Here also is a card I worked on the other day. I tend to want to load up my cards with every embellishment I have so I am trying to work on simplifying. Here is a general card I made that can be used as a thank you, congratulations, birthday, good luck, or " just to say hi" card . I still used quite a few materials but kept to one color scheme in cool hues (baby blue, black, silver/grey) and kept embellishments to a minimum by my standards...... I love the lightly stamped butterflies over the border - very subtle. Less bling - more bang! This card I will enter into the Addicted to Stamping "Blue Challenge"
I am hoping to enter some more challenges this week so will be back with a few more card postings. Happy crafting! 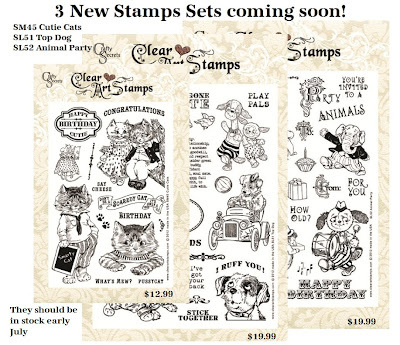 Next Tuesday, Tiddly Inks will take the giant step of offering physical clear stamps---not just digital stamps--wow! These are so cute and super easy to make.... I had both cards done in 30 - 45 minutes. I used pre-made blank cards by Doodlebug Design. Each package of 8 had cards in 8 different colors. The inside is patterned in pinstripes and the front and back are a matching solid color - the window on the front of the card is trimmed with printed stitching. My favorite part is the top loading "money" envelopes. SO cute! To decorate the card I used Sock Monkey stickers by Recollection, ribbon trim by Jolee's Boutique (French General Collection), buttons, baker's twine, glue dots and Stickle's red glitter glue. After I was done adding the embellishments I cut out 4 scalloped squares - one on Core'dinations card stock red and one on kraft paper. The kraft paper was stamped with a simple "happy birthday" in Tim Holtz Vintage Photo ink and embossed with clear powder. The edges of the red scalloped paper were given an aged effect with the stamp pad. Next time I will use double sided tape or a tape strip to adhere the ribbon so I do not get the bubbling effect but other than that I love, love, love the way this turned out - especially as it took a fraction of the time to complete compared to most of my projects! 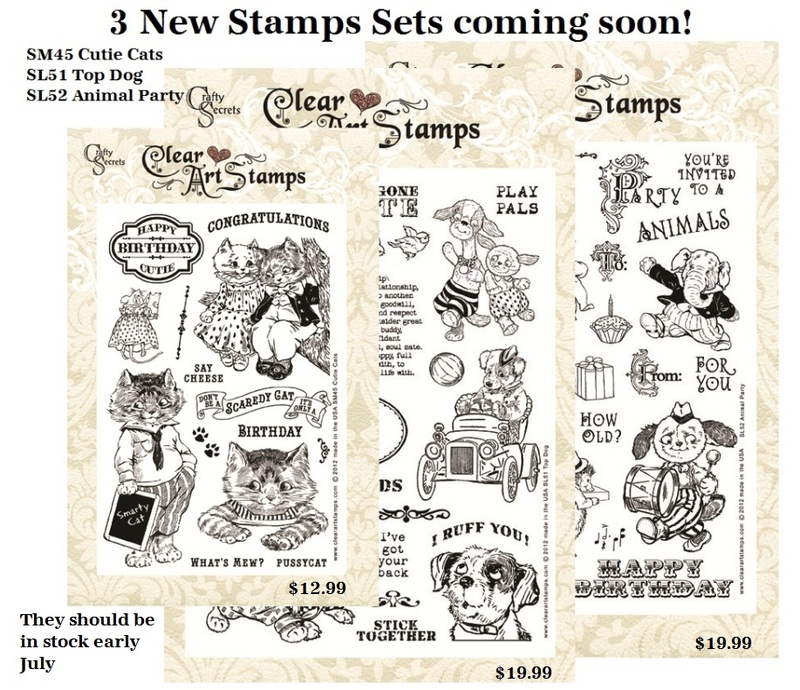 Crafty Secret's Linky Party and Giveaway - 3 NEW Clear Art Stamp Sets! Crafty Secrets is hosting a Linky Party. 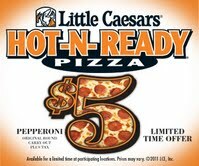 To celebrate they will be giving out a $50 or the 3 new stamp sets to 2 winners. (see picture at the top of this post). Crafty Secrets specializes in vintage images of all kind. Not only do they offer a wide variety of stamps, but they also have digital images, printed images, paper, scraps and more! They are one of my all time favorites and I have several collections of their stamps. The image below is a card I created using the American Beauty set, wide navy ribbon, red card stock, Authentique paper, bakers twine, Tim Holtz paper, flowers, rhinestones and a couple of patriotic stickers. My favorite set is the Greetings from Wonderland - these are much more simple using layered stamp images from the set and colored in with Prismacolor pencils. These were placed over solid cardstock which was layered over hounds tooth printed paper. the card was also embellished with cutouts, gel pen and glitter. · Why Do I Lose My Baby Teeth? Thanks to 20th Century Fox I have 3 copies to giveaway to readers. Cannot wait to see if you won? The Tooth Fairy 2 is available from major retailers or directly at www.FOXCONNECT.com. 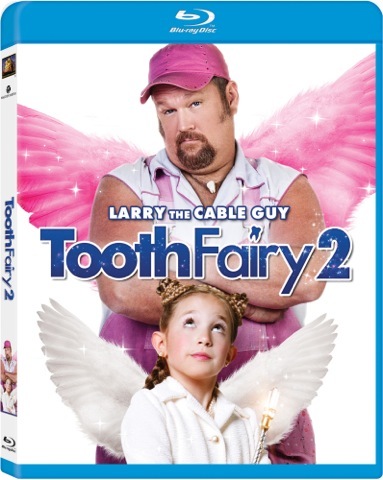 To enter simply post a comment about why you want to see this movie or who you would want to watch this with AND if you prefer a DVD or Blu-Ray version. Giveaway will close in two weeks (07/08/2012 at 11:59 pm EDT) Winners selected at random. Must be 18 or older and a permanent resident of the US. Email must be included in your comment or viewable on your profile in order to win. Potential winners must respond within 48 hours to notification email or another winner will be selected.